Early July, hints of the returning sun with beautiful sunrise glows on the horizon about noon. Ice good for runs with dogs, poor for skiing. 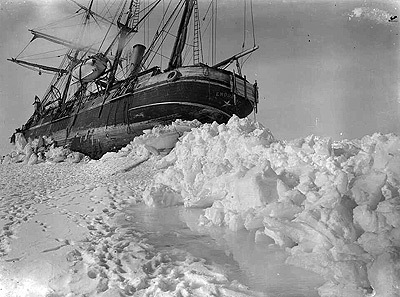 Severe blizzard been blowing for last two days, temps from -21F to -33.5F winds of 60-70 mph making the ship tremble, subsiding a little now. All hands out to shovel snow, many dogs buried in their kennels but all survive. At least 100 tons of snow piled at the port side of the ship. 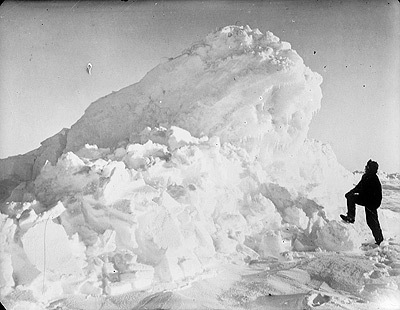 Ice-pressure indicated by distant rumblings and formidable ridges appearing is an increasing cause of anxiety as they gradually approach us. 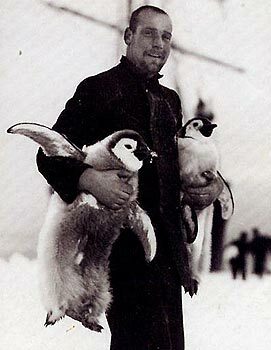 Catch 4 emperor penguins today in a small lead, a very welcome addition to our larder, they are from 45 to 75lbs. It is as if a mighty giant is beneath the ice, ice is rafting to 15ft high moving at 200 yds an hour, driven by the power of distant storms. 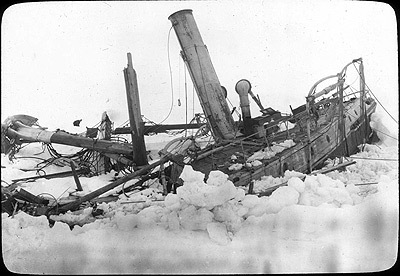 Creaking and groaning ice, we have 24 hour watches, the deck is cleared to bring the dogs aboard in a moment. 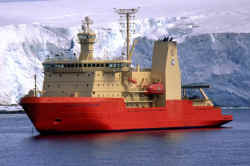 Ship shaken by heavy bumps in the night. Long months of rest and safety seem to be at an end, and a period of stress has begun. The sun's edge has been seen thrown above the horizon by refraction, it is now delightfully light at noon, the end of the darkness is near. 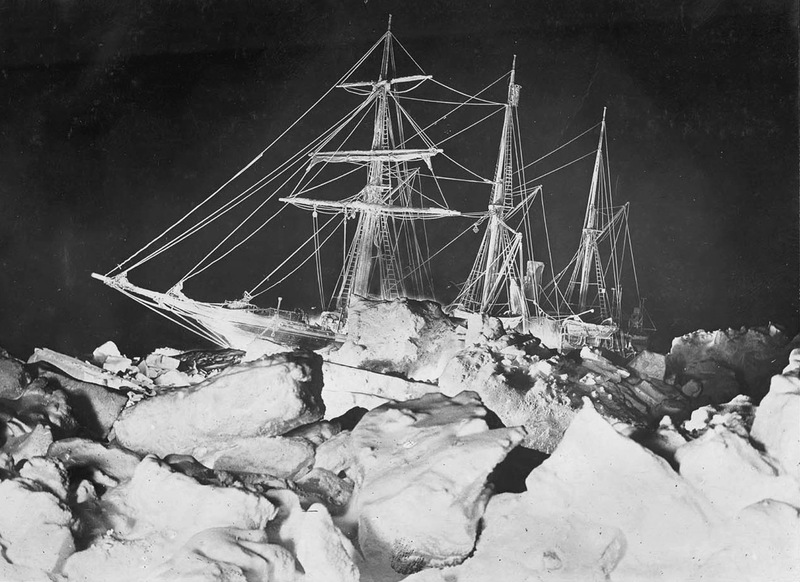 SW storms have set the ice northwards, chances of clearing the pack in spring rest on getting north, real fears of the ship being nipped. 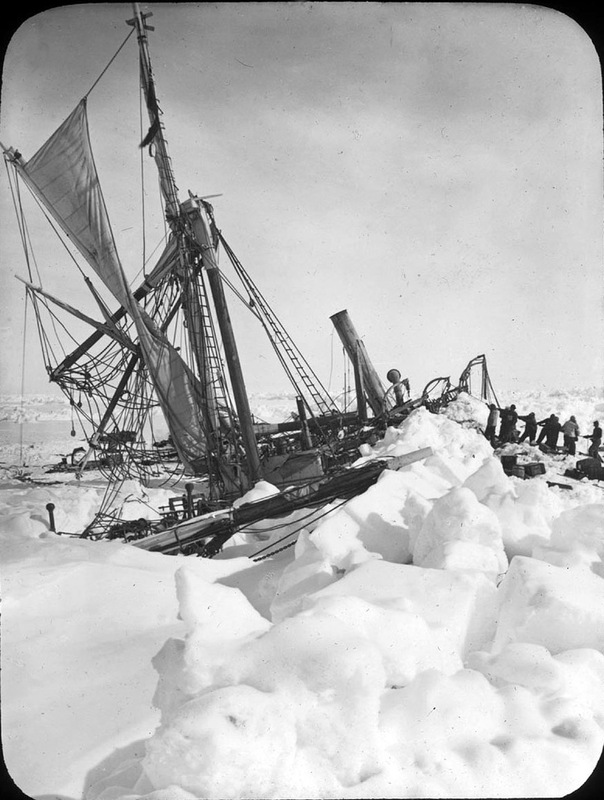 10 am a year to the day we left London our floe began to break up cracking creaking and rafting of ice tips the ship to one side and back. Our 45 dogs were brought aboard in 8 mins, split floes push together again and rise up. 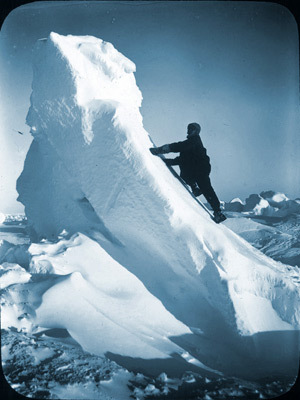 Picture - Worsley with rafted ice. Dog Town and landmarks are no more, left behind or broken up, the ship groans under the pressure, we pole away an ice lump from the rudder. We were standing at the ready to take to the boats and leave the threatened ship when it all stopped in an instance, Antarctic serenity prevailed once more. 9 hours of twilight. Occasional rumbles from the ice. Dogs rehoused on deck in wooden kennels we have moved 37 miles north in 3 days. 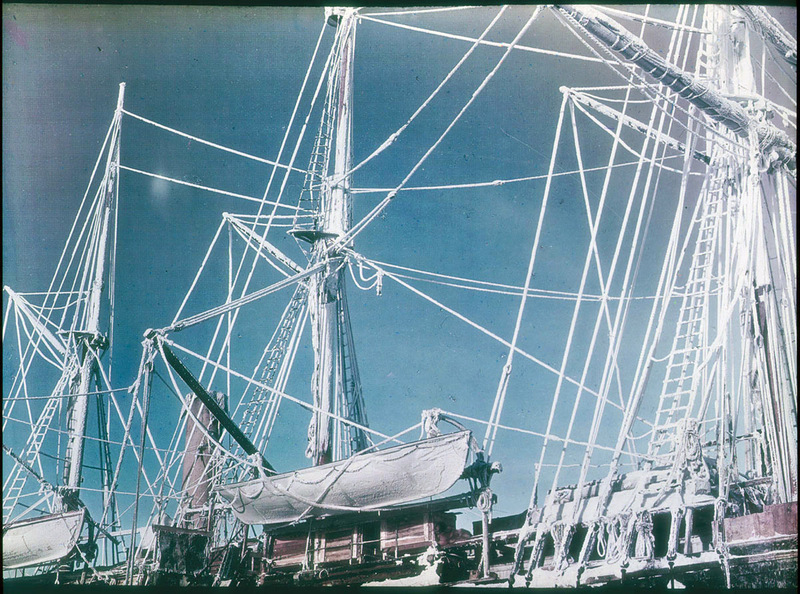 Rigging encrusted with rime. 10 hours daylight today but cold with drifting snow. Two emperor penguins captured yesterday and a further ten today, Hudson is our champion catcher, a highly valued skill. 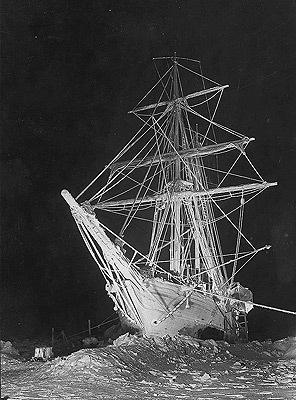 Hurley took a picture of the ship at night with 20 flashes, stumbling around half blinded banging his shins after! The ice was active in the night, ships timbers groaning and creaking, snapping sounds, planks on deck buckle and relax again but no leaks yet. 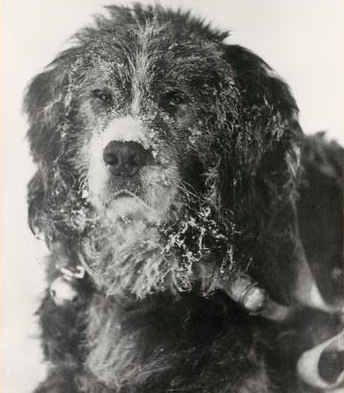 Very cold, temp down to -47C, heavy rime on all surfaces, Having to melt snow for dogs to drink, they used to eat snow when out on the ice. Exercise the dogs, soccer in the afternoon. 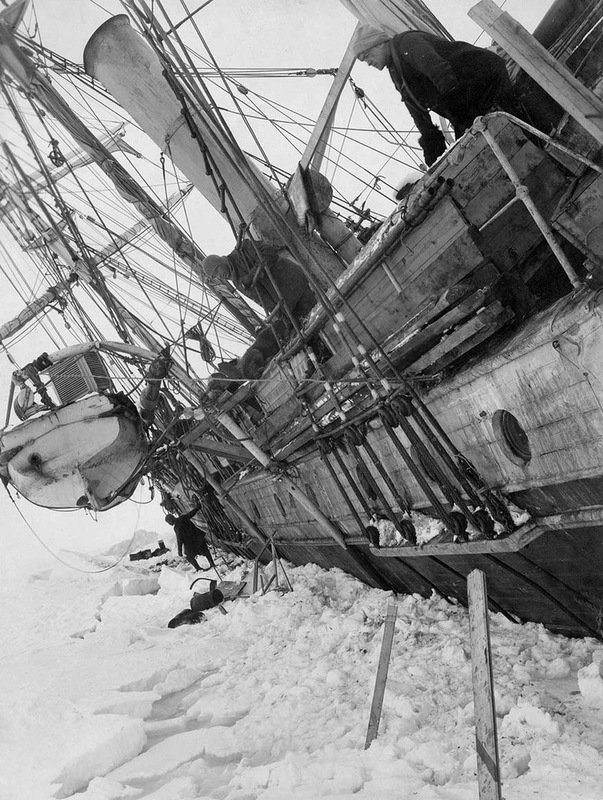 Explosions from the ice in the night, ship creaks as if in pain, some doors no longer close, the ship is leant over. We live very well, looking forwards to getting fresh seal meat again. 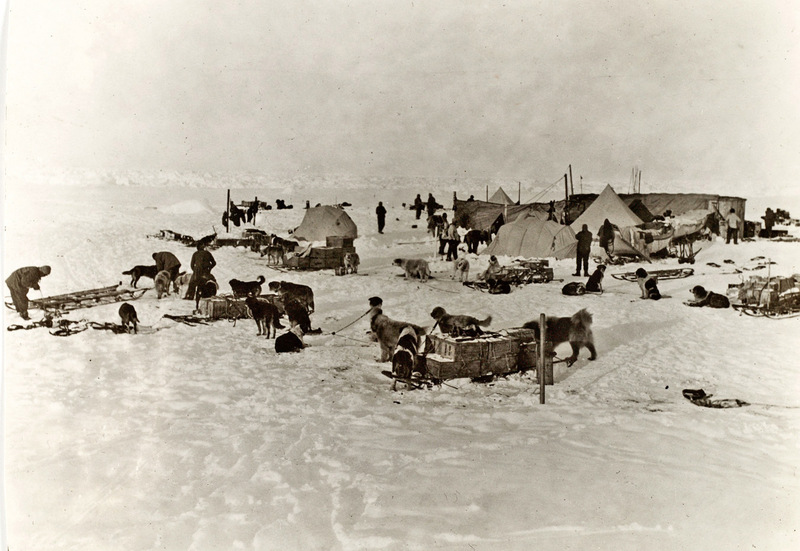 Powdered milk formerly disliked and given to the dogs is now popular with the men. 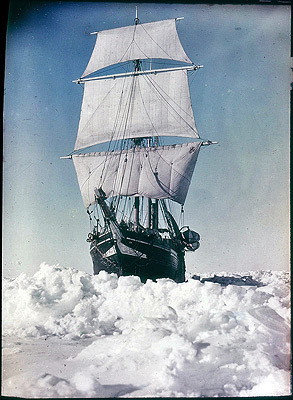 The ice seems on the move again the ship is shaken from stem to stern, nearly shook Orde-Lees out of the crows nest! It moves and then nothing. 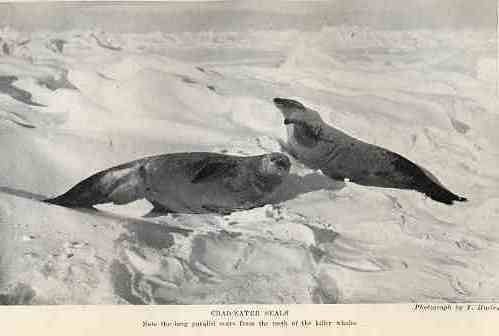 Dozens of crab eater seals appearing, managed to get 3. Many bear large scars from close encounters with killer whales. The floes are moving. Several cracks appeared in the ice, the rudder can be seen not to be as damaged as feared though we are held in a huge ice cradle 40ft deep. Today we move to summer quarters in the upper cabins in high spirits, everywhere drips with a thaw, we eagerly anticipate an early release. 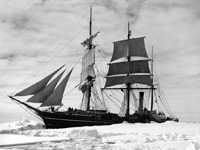 The ship is upright again and free of the floe, dogs are in uproar at the penguins, seals and even whales all around. The breeze freshened today and we progressed 200-300 yds along a lead before the ice closed and held us fast again. 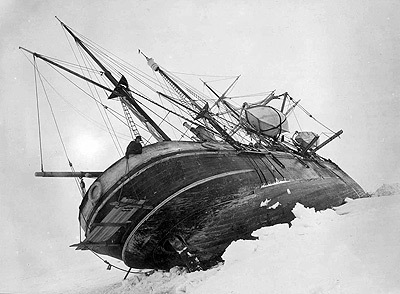 Huge ice pressure, metal floor plates bent and buckled, at last the ship rode upwards, the stern lifted 9ft we survived against expectations. Spent the day making good after yesterday, at 4pm floe pressure pushed the ship over to 50 degrees, we thought the ship might turn turtle..
Rescued dogs from kennels, everything is at a ridiculous angle. 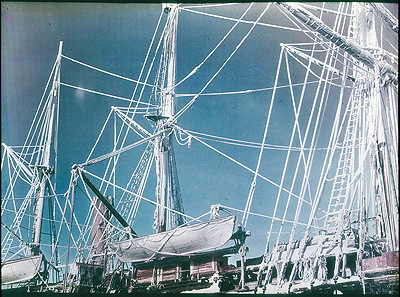 Battens have been fixed to the deck to aid walking, later the ship righted herself gently. Got steam up today for the first time in 8 months and turned the engines, watchmen are set to take immediate advantage of any open lead. The ice grinds all around making a sound like distant traffic, the Endurance shakes slightly but constantly, only major upheavals cause concern. A strong NW wind results in formidable movement of the floes and pressure ridges, water-sky over 100 miles to the north shows open water. A great crash this evening, the Endurance listed over at 8 deg, all went out to find Shackleton already there. Worse than imagined, sternpost almost wrenched out, water pouring in, steam got up and the bilge pumps started. The ship is bent by the pressure, McNish is building a coffer dam to keep the water back, others are moving stores preparing to abandon ship. The steam pumps are not up to the job and water is still rising. 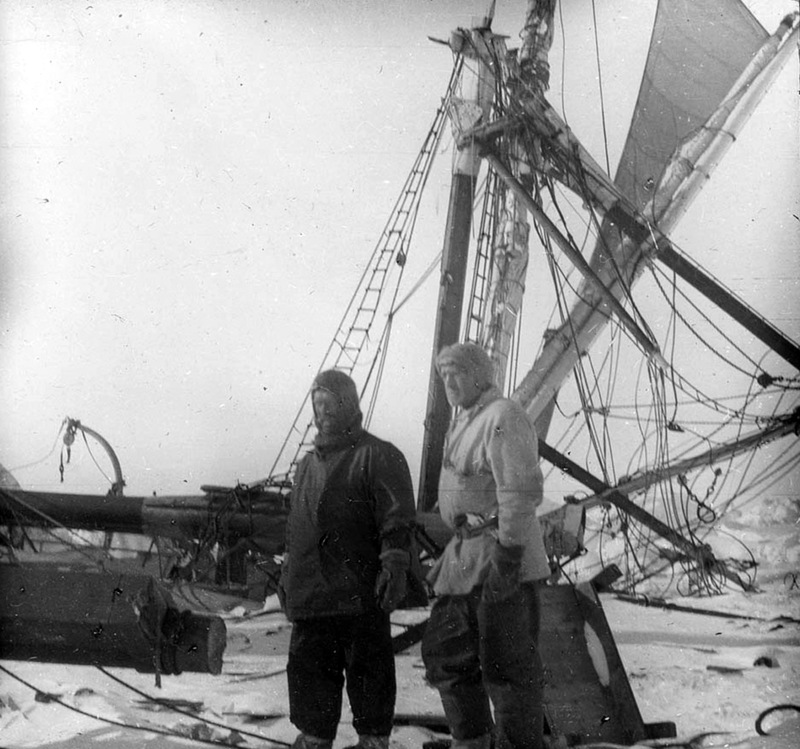 Worsley Greenstreet and Hudson are down in the bilges to clear ice from the hand pump. 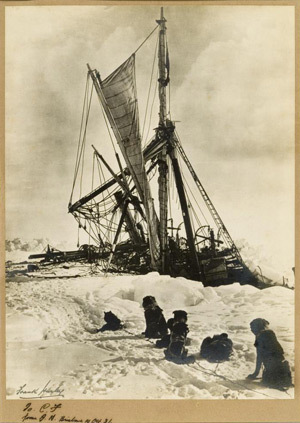 Worsley - We dig a hole down through the coal, beams and timbers groan and crack around us like pistol-shots. The darkness is almost complete. 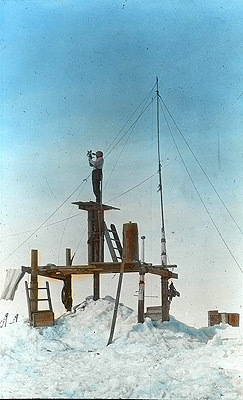 Hand pump working through the night, trenches dug in the ice are easing the pressure, all are wearing extra clothing ready to abandon ship. Ice pressure has subsided, hand pump is being worked round the clock, McNish has worked without sleep to build a dam across the inside stern. The outlook is bad, heavy pressure ridges are all about, many tons of ice are pushed by winds or currents, piled up and tossed aside. We are helpless intruders in a strange world, our lives depend upon the play of grim elementary forces that made a mock of our puny efforts. Pumping water from Endurance continues, we are burning seal blubber as extra fuel to try and eke out the coal, the roar of ice pressure surrounds us. 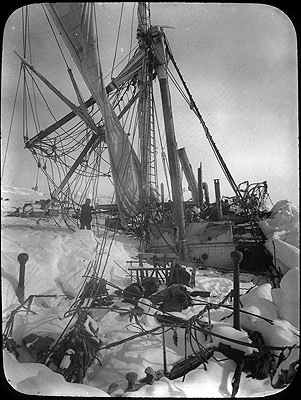 Serene sunshine, blue skies and over 22 hours of daylight contrast with our predicament, 3 boats, sledges and provisions are lowered to the ice. 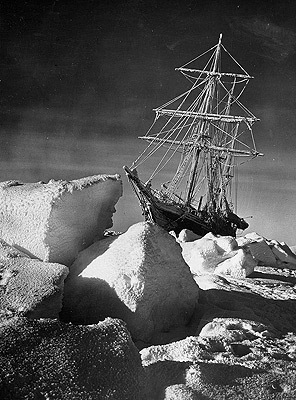 Our worst fears are realised, the Endurance is stove in, crushed by the ice beyond anything we can do for her. Shackleton - A sickening sensation to feel the decks break under one's feet, great beams bending and snapping with a noise like heavy gunfire. 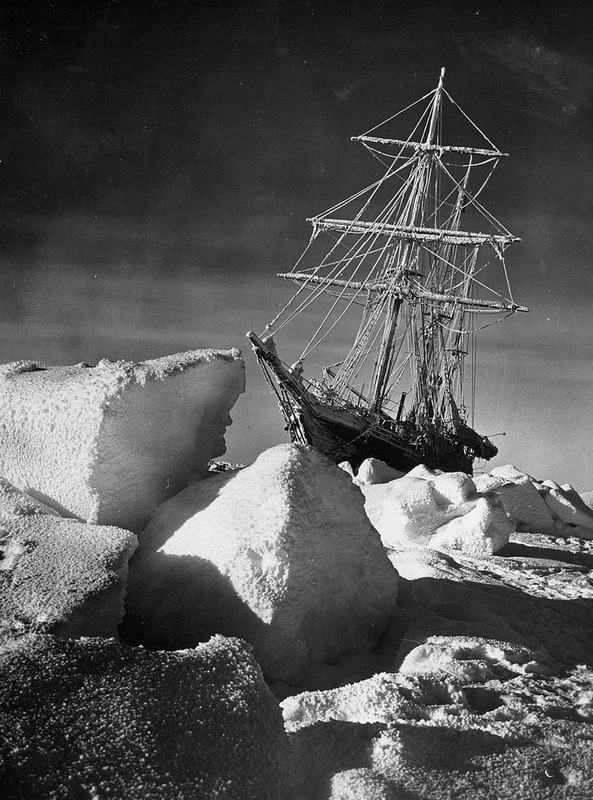 Like a cat with a mouse, the ice plays with her lifting and letting her slip, holds flooded but she does not yet sink "Out all sledges". Our intention is now to make for one of 3 islands, the nearest is 346 miles away. We have 2 boats on runners and all dog sledges, a camp is made on the ice floe. 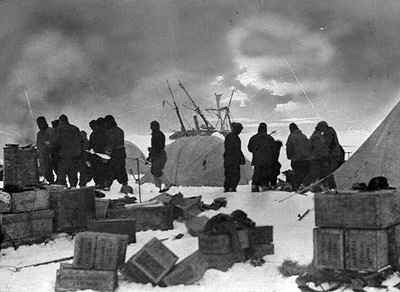 We were putting tents up for the night when the ice began to split beneath us, boats, stores and equipment had to be moved 200 yds to a larger floe. A cold and uncomfortable night, at midnight the ice cracked right through the camp, all were roused to rescue gear and move once more. Continuous and terrible sound of cracking timbers all day and night from Endurance, yards on foremast carried away. 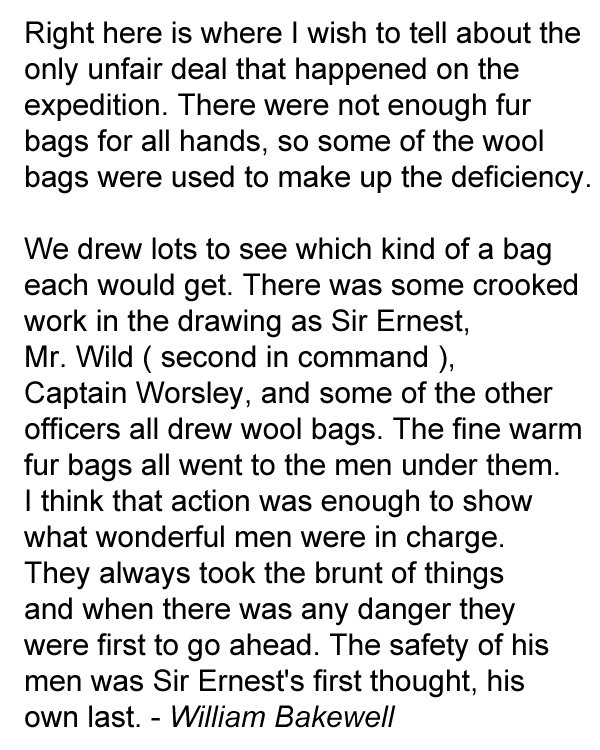 Polar clothing issued by Marston, lots were cast for the 18 reindeer fur sleeping bags Bakewell called shenanigans. 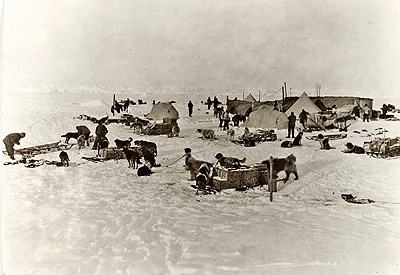 We are to start a march across the ice at 3pm to reach land, limited gear only, all other items to be thrown away, we call this place "Dump Camp". 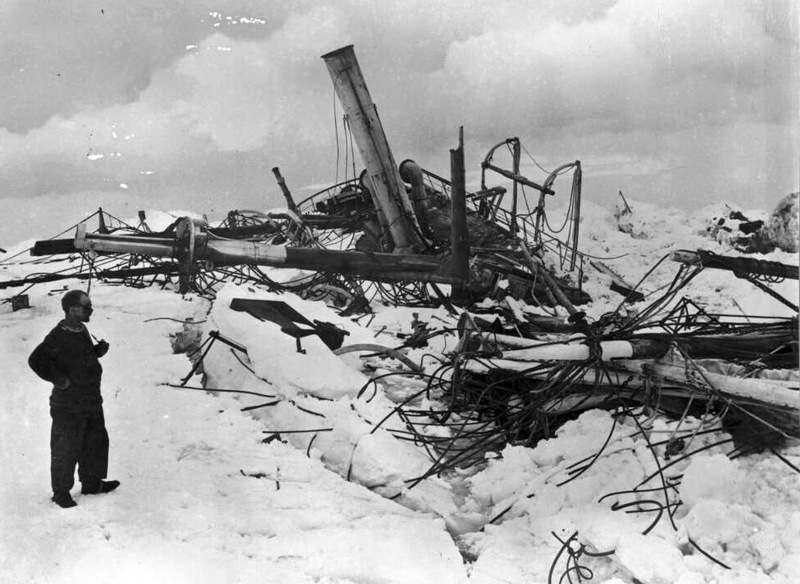 Shackleton set an example and threw away his watch, 50 gold sovereigns, silverware etc we did the same, piles of scientific and navigation gear lie discarded in the snow. 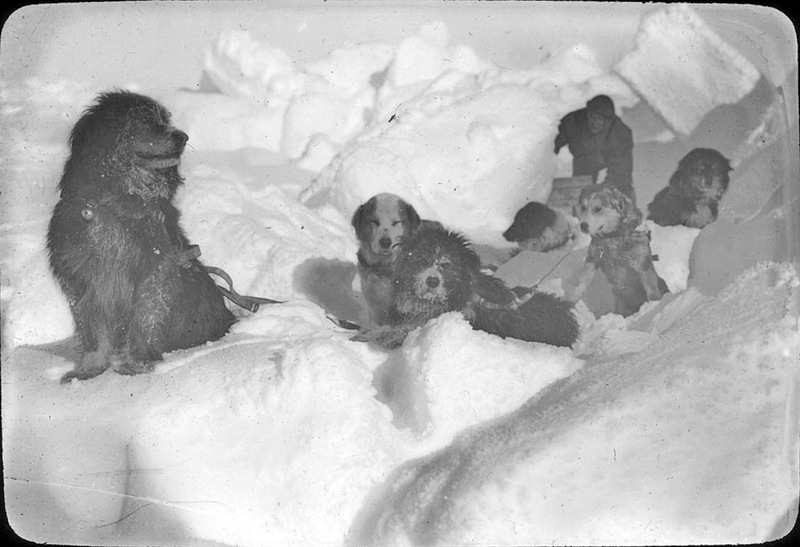 Mrs Chippy, the ships cat, and 4 pups were shot as we set off, decades later McNish when interviewed would only say "Shackleton shot my cat"! 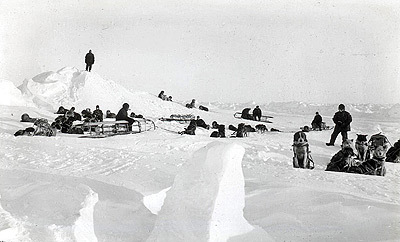 28 men and 49 dogs set off pulling sledges and boats we thought 5-7 miles a day possible, this first day we did 3/4 of a mile. 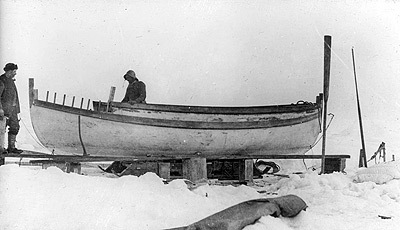 A wretched day, heavy snow, warm, everything wet, very heavy work pulling the boats, made just 3/4 of a mile again, sounds of killer whales all night. 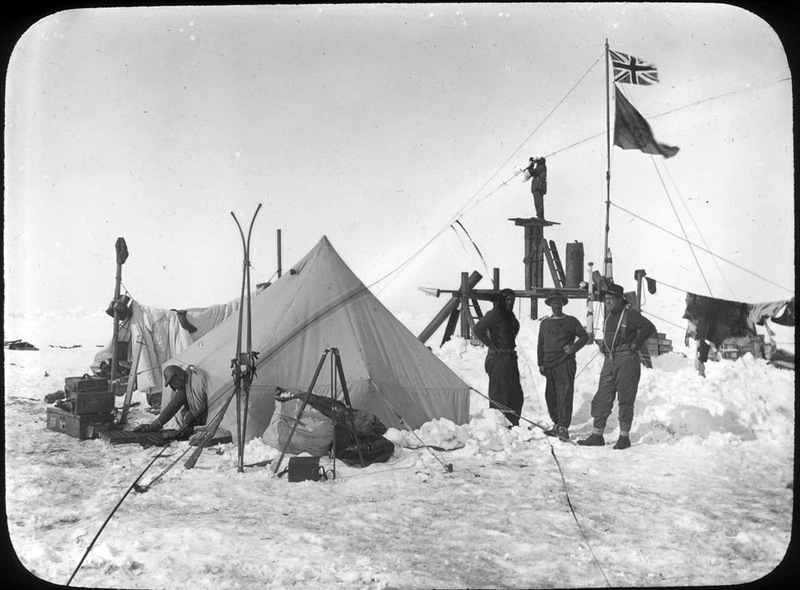 It has been slow and hard progress across the floe, Shackleton has decided to sit it out, we make "Ocean Camp" 1.5 miles from the ship. Awful surface for travel, the snow is 2 ft deep everywhere, we sink hip deep at times, to save sledging rations we are to live on seal and penguin. 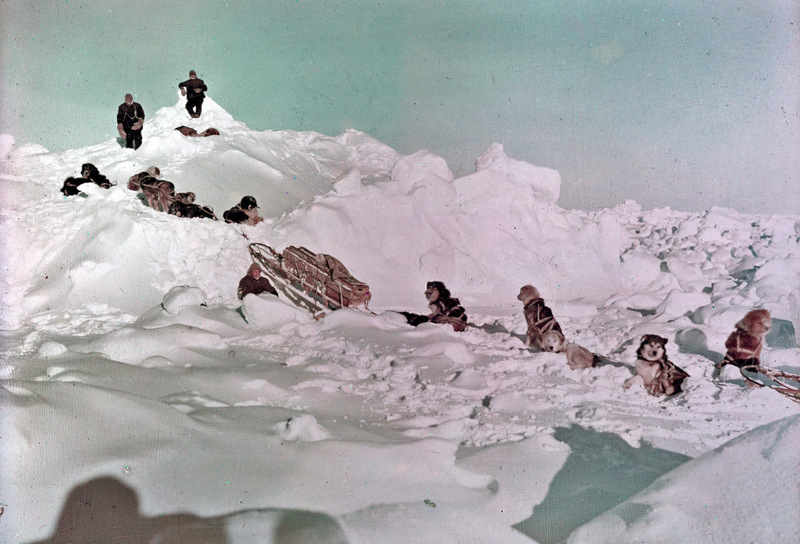 Wild took dog teams and sleds to retrieve supplies from Dump Camp and the ship, though her deck is now under water. Hurley cut through a thick wall and dived through 4ft of mushy ice to rescue his negatives. (so we have the pictures on this page today). Wood, rope and other provisions are being retrieved from the ship by relays of sledges, short rations are leading to weakness. A party cut through the 3" deck of the Endurance 3ft under water to get stores, a gush of water with walnuts and onions emerged. 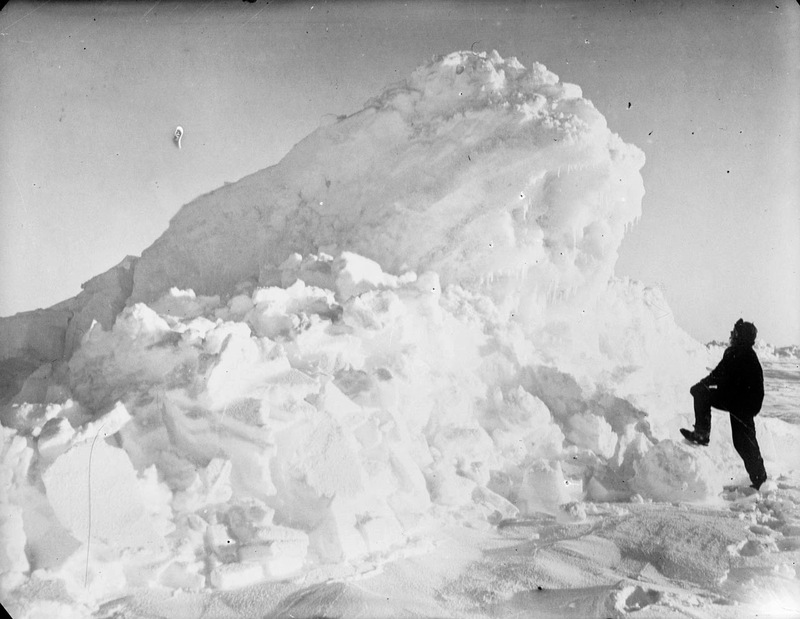 Cases are guided to the opening by boathooks, cheers or groans when they buoyantly emerge according to their contents, calm ice conditions help. We now have 3 tons more stores, all the flour and most of the sugar, for the first time in 10 days we have eaten well, it has been hard work. A galley has been made from sails and spars, the wheel house has been removed intact, a lookout has been made to sight our position and also to spot seals and penguins. 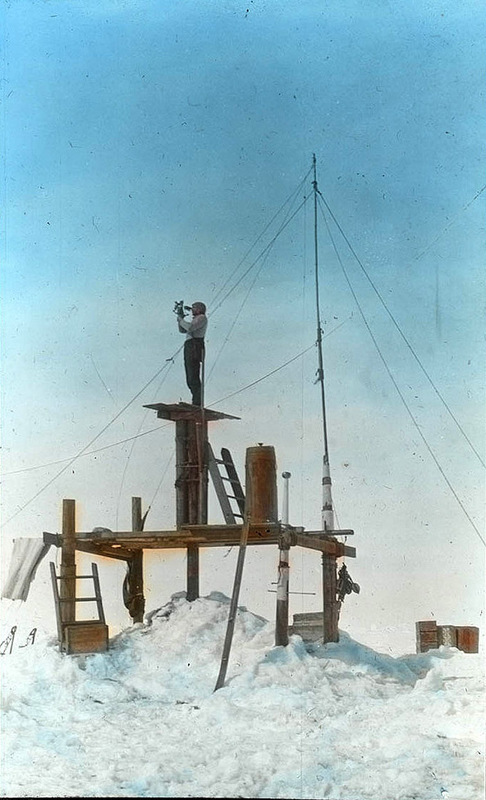 Howling blizzard, drifts everywhere, provisions are under 2ft of snow, Hurley & engineers are cutting an ash chute with a chisel to make a blubber stove. The blizzard is over but has pushed us north. We are 300 miles from Snow Hill Island which we hope to reach. Weather warm and fine, we would prefer to be pushed by a blizzard. 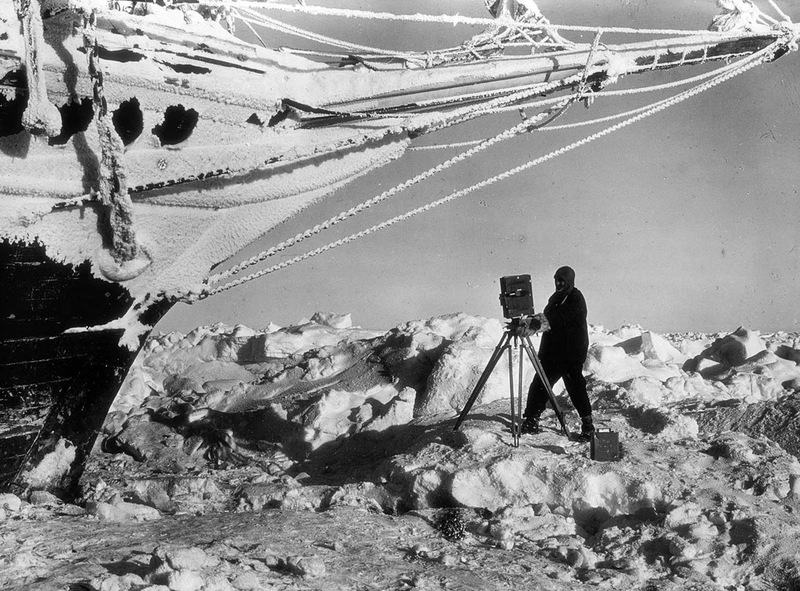 It is almost beyond conception we are living on a colossal ice raft, 5ft separates us from 2000 fathoms of ocean drifting to who knows where. 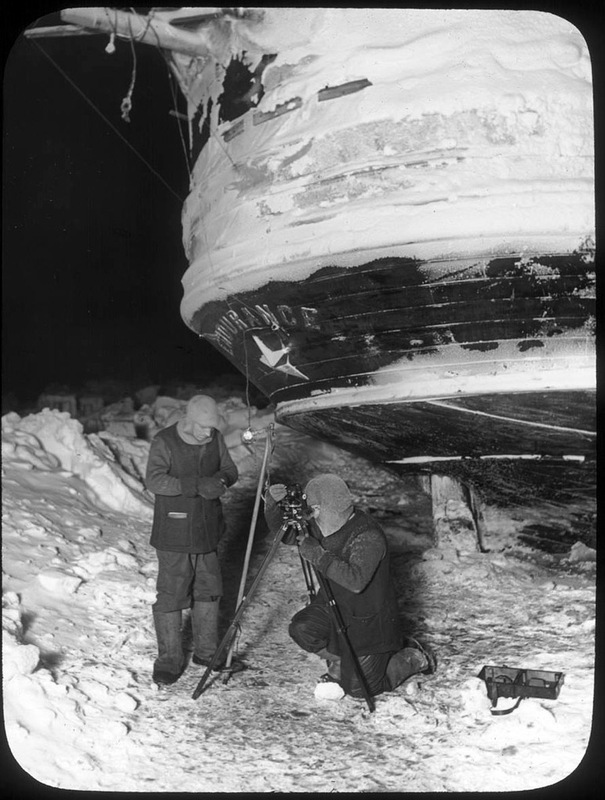 Hurley and Shackleton sort through photographic negatives to reduce weight and space, 400 are broken to prevent later rescue and 120 kept. All food is eaten carefully and accurately divided. One man shuts his eyes calls random name, while cook points to each portion, saying "Whose?" 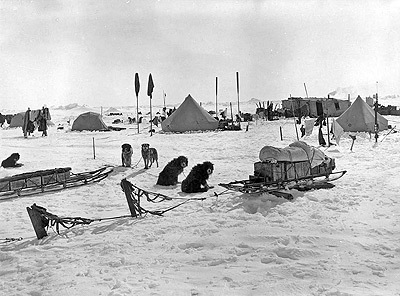 No dry place to go in the thaw, warm temps enable us to pack rations and provisions for the sledges in preparation for our journey. A distant crash from the Endurance later in the day as the mast went, the bows are under water and are over-ridden by ice, soon she will be gone. We keep returning to Dump Camp to retrieve what we can, it is a monument of desolation with costly equipment and expensive clothes scattered. Our 3 boats have been named James Caird (25ft), Dudley Docker and Stancomb Wills (both 21ft) after the main backers of our expedition. The carpenter is adding the gunwale from the now derelict motor boat to the James Caird, raising her height by 10". The blubber stove performs admirably, baked "bannocks" of flour, fat, water, salt and baking powder alleviate our craving for bread somewhat. She has gone. Lying in our tents, the Boss called "She's going!" 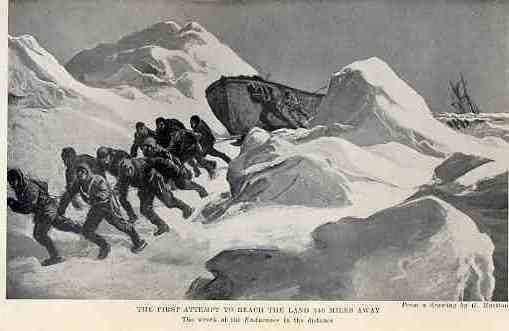 1.5 miles away we saw the bows down, stern in the air..
...one quick dive and ice closed over the Endurance for ever. She was a link with the outer world our isolation is complete "She's gone boys".